Haskell provides integrated design, engineering, construction and professional services to industrial, commercial, government, and civil infrastructure markets. Its family of brands includes HR Gray; Seiberling; FreemanWhite; and Benham. Corporations, developers, institutions and public agencies choose Haskell due to its expertise in integrated project delivery. 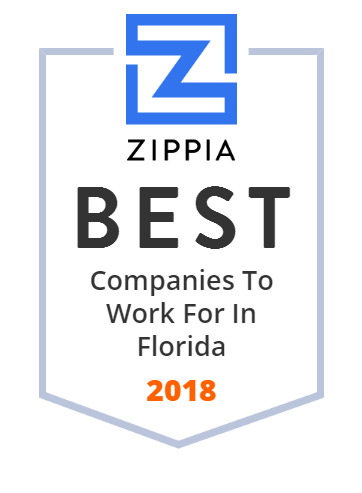 Headquarted in Jacksonville, FL, Haskell serves clients from strategic points within North America, with significant expertise in Latin American, European, Asian and Caribbean marketplaces. Headquartered in Fort Lauderdale, Florida, VEEDIMS has successfully developed a robust loT platform that is poised to become a global leader in its space. This company's engineers come from all over the world. Their team consists of a diverse group of passionate visionaries, technologists, designers, coders and engineers working together to bring the IoT to life so their customers can do all kinds of innovative things with things. NYMBUS, the core banking modernization company, enables financial institutions to digitally transform their businesses, from redefining the holistic customer experience to removing workflow friction. Port St. Lucie is a city in St.
Houses.com is the world's largest online marketplace for single-family homes with over 3 million properties for sale, rent & vacation. Shop for a home or get FREE mortgage advice, moving quotes & more all under the Houses.com "roof". We have 117 stores located on the Gulf Coast of Florida, Alabama, Mississippi and Tennessee. All are open late and many remain open 24/7 for your convenience. Web.com Group Inc. is an American company headquartered in Jacksonville, Florida that provides domain name registration and web development services. Modernizing Medicine, Inc., is a software company headquartered at the Research Park at Florida Atlantic University in Boca Raton, Florida. The company has two co-founders: Daniel Cane, CEO and co-founder of Blackboard, Inc., and Dr. Michael Sherling, Chief Medical and Strategy Officer and practicing dermatologist. Idea Recruitment, a subsidiary of DCSI (Dynamic Corporate Solutions Inc.), is a leading recruiting and HR solutions specialist in Florida. Its recruiting options for clients include Temp to Hire, Permanent Placement, Recruitment Process Outsourcing, Project Assignments, and Skills Assessment. Idea Recruitment is a great choice for companies who need recruiting resources or for someone who want to find a job in Florida. Get positive online reviews, and collect customer satisfaction surveys with the easiest software for enterprises, small business, and individuals. Sniff & Barkens is the leading lifestyle entertainment brand for all things dogs! An all-in-one keyless entry system for property managers and real estate agents. Automate property access for your showings, maintenance, and residents. Zoning Ninjas. Enterprise Software for the Real Estate Industry. GovTech & CRE Tech. Real-time credit checks and credit reference information, positive trade debtor (positive data) credit referencing system, CRISworks. Learn.com was a software company headquartered in Sunrise, Florida. Florida Virtual School (FLVS) was founded in 1997 as the first statewide Internet-based public high school in the United States. In 2000, FLVS was established as an independent educational entity by the Florida Legislature. Recognized as its own district within the state, it provides online instruction to Florida students in Kindergarten through 12th grade. According to its website, "FLVS is part of the Florida public education system and serves students in all 67 Florida districts. FLVS also serves students, schools, and districts around the nation through tuition-based instruction, curriculum provision, and training." As a public school, its funding is tied directly to student performance. We offer prizes and once in a lifetime experiences to the creators of influencial videos that want to connect to brands through campaigns with videos. UNATION is the best place to discover events or things to do in your city. By creating your event on UNATION, you can increase exposure to your event with on-demand event promotion and sell tickets with ease. Saikou Optics mission is simple. We are developing a lens that will change the way camera sensors see the world. Florida's security system solution for fully-integrated access control sales, service, installation and supplies. 60 years of service. 24/7 availability. Florida's #1 website for local items for sale, real estate, jobs, garage sales, home services, restaurants, and more! We Believe the patient should be educated by their therapist in order to be able to maintain maximum flexibility and pain-free living long after our work ends. Bringing real trust, real loyalty and fun back into the consumer/marketer relationship. Sellstate Priority is a full-service brokerage firm based in Cape Coral, FL. Its agents have an extensive knowledge of the serviced areas and take care of clients' home buying and selling needs in SW Florida cities of Bonita Springs, Cape Coral, Estero, Fort Myers, and the islands of Sanibel, Captiva, and Pine Island. Mortgage information, interactive maps, listings of homes for sale, and other features can be found on the company's website. We help streamline, manage & grow your business with confidence by providing software solutions that connect, integrate & simplify all aspects of your business. Merchant service provider. Offering flat-rate, month-to-month, and no strings attached transparent credit card processing. Direct Cost + 0% Ultra Low Fees. CrowdSmart's proprietary collective intelligence and machine learning technologies enables startups to better determine market needs and accelerate traction. JCR Systems is a leading provider of Point of Sale Systems in the Hospitality and Retail Markets. From Cash Registers and Scales to Point of Sale Systems. ACISS Systems, Inc. provides fully integrated information management and analysis solutions for law enforcement. Voke is a community of Christians inspiring hope and building deeper friendships through faith. Mindpix Corporation, a media company, focuses on owning, creating, and/or managing music, entertainment, sports, and U.S. Hispanic media properties worldwide. The company provides on-line video technology, production, digital marketing, audience development, payment, sponsor acquisition, and digital and traditional media distribution services. It operates a collection of multimedia and family entertainment content, as well as provides licensing rights to the original master recordings of a music library catalog of approximately 17,500 songs by various artists. The company is headquartered in Miami Beach, Florida. Mindpix Corporation is a subsidiary of eMax Worldwide, Inc.